Isn’t it a magical world in which we live? We have this amazing tool that lets us find, share, and save some of the most interesting, beautiful, and funny things on the web. 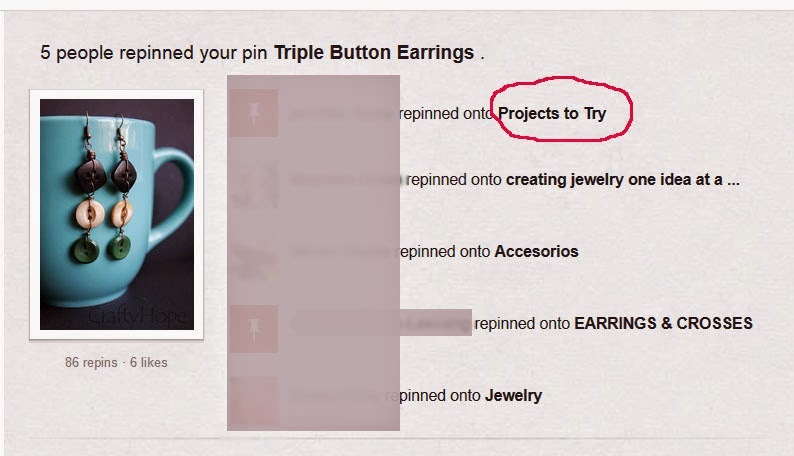 Oh, yes I’m talking about Pinterest. Pinterest is a wondrous place where we all lose track of time. So many tempting sweets, funny images, luscious foods, time and cost-saving tips, inspiring quotes, and OH. . .that crafty haven of beautiful, simple, why-didn’t-I-think-of-that-ideas. You know what else it is full of? Products that both struggling artists like myself and big companies are trying to promote, get seen, and sell. When I make an item of jewelry I put my heart and soul, my time, and my precious, hoarded beads into it. And where does it end up? On your “I Can Make That” Pinterest Board. Do you have any idea how that makes me feel? That’s my own original idea and design. Don’t get me wrong, I totally appreciate that you admire what I made, that you want to save it, that you might even want to make something like it. However, please don’t be so blatant about it. I’ll admit that I personally have other designers’ pieces saved as inspiration on Pinterest. There are a lot of great ideas and interesting use of materials out there. I don't plan on copying those ideas, just using them to spur me forward in my own designs. I also look at pinning their creations as a way to share these unique designs with other people around the world and help the artists advertise the fruits of their labor. When our work ends up on a "Jewelry to Make" board, it cheapens our art and makes us feel like less of an artist. Obviously you can probably make it, or something of a replica of it. But, by placing our art on your “Crafty” board you’ve told the world that our work isn’t worth buying, you can just make it yourself. All I’m asking is that you consider re-naming your Pinterest board “Jewelry Inspirations” or “Designs I Admire” or something along those lines. Think about using your “DIY” board instead as the perfect place to save actual tutorials you’ve found, not an item someone is selling. Please help us share and promote our hard work, support small businesses, and keep the ideas of what you also want to try. But, be aware that many of us see where you’ve placed those pins of our art. Be tactful about where you rank it. That’s all I’m asking. Feel free to head over to Etsy, take a look around my CraftyHope shop, and Pin away! very well said and a very reasonable request for the pinners to not so blatantly state their intentions...good for you for putting this in words for others to agree with or ponder their pin categories. I don't make jewelry, but used to paint and ran into the same thing. Usually people wouldn't come right out and say they could do it, but they would turn to a friend in the gallery and say, "Oh, you can do that!" or "We should take a photo and show it to Sally so she can do one like that!" . . . humph! I say, go get the materials, organize them, find the time, get it just right, and have at it. Most people want to compliment you by copying, but in reality, they never get around to doing it. When a true art patron comes along, they are appreciated. Great article! Good point - I never thought of it that way. Hope, this is very well said, very well-written. When I find items I like, I love to pin them to my Inspiring Designs Board or my Cool Earrings Board. Like you, I love to see new uses for materials and new ways of doing things. I do have a tutorial board also. When someone shares, that's the place for me to go try a new idea, not a shop owners designs. Thanks for telling others how it should be. Lee, I'm so glad to hear you agree with me. I was a little afraid I would get a bit of flack for this. What a relief to get so much support! Thank you!! It's one thing to say you can do it and quite another to actually create something unique. Unfortunately, it only takes a nanosecond to post something. I asked a friend how long it took her to make this wonderful crocheted piece. Her response, "How long does it take you to write a poem?" Well put I told her, because honestly I have no idea. Art takes talent, passion, and most of all, the time to dedicate yourself to creating. I suspect most Pinners never actually create anything. Alan, You're likely right. And, most of the time I expect that they don't copy my pieces. It's just the assumption that "I can make that myself" that really just gets my goat. I know most people aren't really thinking about it being a 'steal the money from my pocket' situation but I also figure they aren't thinking about it at all. I just had to put my statement out there and get it off my chest before this issue drove me a little bonkers.